AND then SCROLL TO THE BOTTOM OF THE PAGE. Pearl "Live in the Solution Not in Pollution"
Pearl is a part of an ocean series that I have been creating to honor the healing of our oceans. Since moving to Sarasota, Florida a year and half I ago I became more conscious of the effects pollution is having on our oceans. The ocean has always carried a special place in my heart. Growing up in Alabama I vividly remember all the family vacations we took to the panhandle. In fact it is the only vacation location our parents took us. For me it always felt like visiting another planet. The magic was all around. I remember building sand castles, jumping the ways and floating on rafts and giggling the entire time. My brother and I love the calm energy of being around the ocean. The ebbing and flowing of the waves brought a much needed stillness that we thirst for in our world. We could always count on the ocean to bring out the playful side of our very intense family dynamics. So those trips to the beach represented a soul healing journey for us. When my husband and I moved to our dream home in Sarasota, Florida I was beyond thrilled. I could now go any time I wanted to the beach. The “fine white powered sugar ” sandy beaches brought such a joyful smile upon my face. But then after about 6 months a devastation problem arose. Red Tide hit our area. It was like a killing field. Tons upon tons of dead fish and mammals drifted to our shores. Not even birds dared to venture to the shoreline. I became devastated to say the least. Although everyone says Red Tide is a natural occurrence, I can’t believe that the intensity, for which we were experiencing for well over a year, is natural. I knew I had to do something, no matter how small the contribution. I couldn’t just sit back and watch it all happen without doing something to heal my part. A still voice inside whispered, “paint your prayers”. So I decided right then, to start a series of ocean paintings. Each one would also symbolized the healing path of my own journey. I try my best to live by a saying that I learned in Girl Scouts, which was taken from a statement by Robert Baden-Powell, “Try and leave this world a little better than you found it…’ My Girl Scouts days are probably the most concrete memories of my childhood and still today when I walk away I try to make sure I left the area a little bit better than I found it. When the idea for this particular painting came through me, the first thing that popped in my mind was the title. I instantly knew this painting was going to take me on an emotional cleansing rollercoaster ride because the foundation was all about sitting in the pollution so that we know what needs to be cleaned up. I think we can only clean up what we acknowledge within ourselves. The pollution is ‘our mess’ to clean up. I think each one of us is responsible for the collective pollution. If we are doing our part I think we are either choosing to clean it up on the inside or we are choosing to clean it up on the outside. Either way we can all make a huge difference in stopping water pollution. I think we all have a job to do to help heal this planet and our oceans are deeply effected right now by our messes. If each one of us, took just a little bit the time to let this issue soak in we would begin to see how important the oceans are to our survival and our children’s survival. Over half of the world's oxygen comes from phytoplankton photosynthesis. That is tremendous! Yet our oceans are sick and they need our help to become whole again. We caused this mess so it is up to us to clean it up. We need to set the wake up call alarm and let it ring loud and clearly until everyone hears it. We can’t afford to ignore the pollution that is accumulating in our seas any longer. Not only is this painting a symbol of my healing prayer for our oceans, it is also a sample of the healing for myself as well. I believe balance is an ongoing journey that never ends. We are always balancing our inner world and our outer world. For me I have noticed as I continue to grow and expand I am able to let go of old patterns that no longer serve me and then I can embrace new patterns. I guess it is like cleaning up my closets, so to speak. For me this is what I am being called to do. By watching my time-lapse video below you will be able to see the symbol of my healing process as it unfolds. It is my hope that you will be able to see and feel the emotional cleansing waves move through the painting. There are layers underneath the final layer that I thought would still show through the finished piece but this painting wanted to present a symbol of healing the water pollution. Therefore she wanted to show the finished painting as sweet and innocent and clear. Originally the painting was going to just be called Live in the Solution not the Pollution, but then when I saw a big circle in the middle of her top I thought it looked more like a huge pearl. For me a pearl is trying to reminder that the most painful festering grit of life experiences can be overcome and transformed into a magnificent beauty , a pearl. All it takes is one step at a time and before we know it we have a beautiful gift of the pearl to replace our pain. I want to add the the background music fit the painting perfectly in fact it gave the painting a whole new life. I find it fitting that it is called HOME. Aren’t we are all trying to get home. The music is by Whitesands. It is so lovely… so soothing and tranquil. It is as if it is a lullaby of the sea. All comments and suggestion are welcomed. I SUPPORT THE 4 OCEANS CAMPAIGN! THEY DO INCREDIBLE WORK IN CLEANING UP OUR OCEANS. THEY OFFER A SWEET BRACELET AS A GIFT FOR EVERY DONATION. Only the Gentle Are Truly Brave At Heart"
I was very happy to take this painting on….that is when I was in the vision stage. However, when it came time to put my vision onto the canvas, everything changed. Let me just start off by saying that SHE had a lot to teach me about myself. I am a lot like my sun sign Taurus. I have two sides. One is like the loving mother cow and the other is the stubborn persistent bull. I am usually easy going by nature and I try to get to win-win with people. That is until I am pushed into a corner. That’s when you will see the bull. NO one wants to tango with a bull. This painting brought my bull side out. This stubborn, persistent and explosive side can be quite the combination. However as soon as i recognize this side, I try to get myself to the closet as fast as possible to do my venting. I hate conflict. This ‘never give up’ mentality can be used to help me get through some very painful lessons but it can also backfire on me. There are times I need to give up and surrender so I can receive help. Unfortunately it usually takes me a long time to surrender and ask for help. It has taken me years of intense inner work to see that the deep conflict I experience externally, was really all coming from the inside out. Even though my path has helped me to wake up and realize this truth, I have still spent many years healing the victimhood mentality. These deep wounds lie festering in silence, until I am ready to once again dive deeper within to clean out the infection that surrounds my soul. Even though I have spent over 29 years in deep self-reflection, when the cycles of healing come around again, I often fall flat on my face, wondering how I once again have forgotten so much of what I’ve learned. This cycle was a big one. 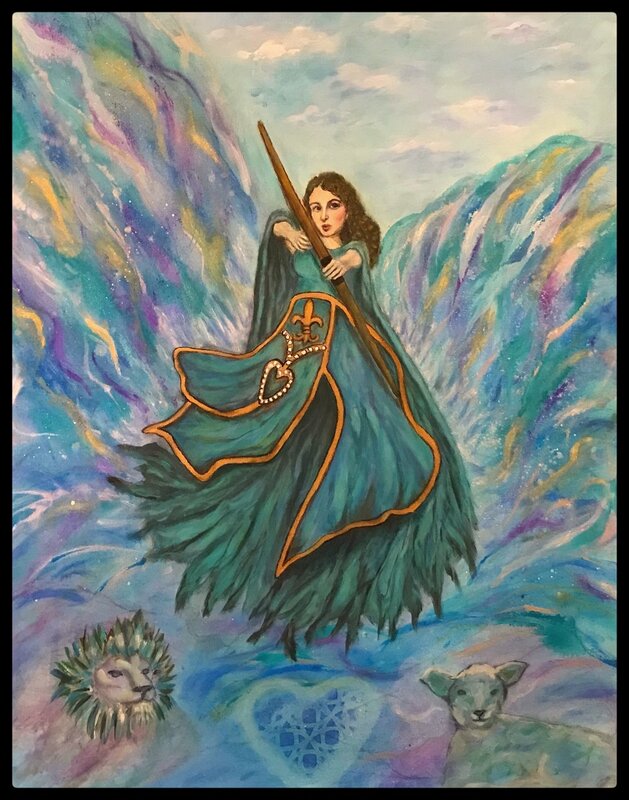 I know it should have been quite obvious that it was going to take some deep feeling on my part to have the courage to raise the warrior within, after all I was painting the Spiritual Feminine Warrior. So it would stand to reason that SHE was coming to teach me things that would require my courage. For me becoming stronger begins within, and one of the ways for me is facing myself in the mirror. I leave this healing tool for the deepest wounds and deeper healing because frankly it is so freaking scary and painful. So off to the mirror I went, with some trepidation but also with lots of denial. The mirror never lies, just like in the story of Snow White. Layers upon layers of emotions began to release from my body as I viewed many faces in the mirror. But I knew it was time to dive within to these shadows selves and own their abandonment and their pain. My only request of my higher self was… “please be gentle.” The tears kept rolling as I released cycles and cycles of pain. With each trail of tears I felt a sense of strength building inside. It takes a tremendous amount of energy to move through waves of blockages so after this type of release I take time to nurture myself. Gentle loving nurturing. A brave heart is a gentle heart. It takes a lot of courage to face ourselves in the mirror. I mean to deeply look within through the reflection in the mirror and allow the mask to lift. That’s when we see so much more that exists within. Song by Frou Frou… is speaking to me. I love this song and I love Imogen Heap! This video was created by my daughter, Mary Kathryn when she was a young teenager. She used the Frou Frou song, “Let Go”, as the music to create her tribute for the movie “Bridge of Terabitha “. I have associated her video so much to this song that I forget that it was not the theme song. It is worth the watch, especially if you have seen the movie. She sums the movie up so well in this video. Sometimes we need to still the waves of life. The excessive chattering that goes on within the mind can be quite exhausting to the spirit. The world moves so fast and it can spin us and toss us to and fro. When the world becomes too chaotic for me or my life is too dramatic or when my body begins to shut down or get too tight, I feel a wave moving through me, nudging me to wake up. Many my times this wave gets really loud and it can feel like a slap on the face, or it can even feel like I have hit a wall. These are the times I remember that all the chaos is inside of me. I am just projecting it out into the world. It is my soul nudging me to let go, allow the breakdown to bring me back to my Real Self. For the breakdown allows the breakthrough to move me to stillness where peace flows. So I was ready to let go. I knew I was ready to shift my focus. The chaos was too loud and my body was anything but peaceful. I knew I could only understand by experiencing it. Meditation is a practice that helps my mind to let go. The mind can have a very hard time surrendering to stillness. To the mind it can feel like death. But by watching my breath and allowing my thoughts to drift by without attaching to them I am able to let go and breathe in the Stillness of peace. This painting was inspired by an online class I am taking with the Dimitra Milan at the Milan Institute. I am thrilled that I found Dimitra’s art. I love the power, freedom and grace Dimitra’s art projects onto the viewer. Ready to go to the next level of freeing myself from the self created imprisonment of my inner judgement, I asked my Soul to guide me to higher ground. I wanted my art to reflect more freedom that I was beginning to feel inside. The tight box I have been living in had crushed my spirit and my voice. It was time for me to own more my creative voice and my spiritual power so that I can give my gift back to the world. I have always had a hard time seeing myself as an artist. Someone with a voice that needs to be expressed through art. I thought artists were only very confident voices of change. I didn’t realize we are all artist. We all have something to share with the world. We are all unique and our gift is unique and the world thrust for our healing elixir. By owning our creative gifts, I feel we help others own theirs. Dimitra’s and her entire family of talented artists helped me to open up more and let go of the tight box I had been in. Dimitra’s gift ignited mine. I highly recommend checking out their art school. Many artists have been freed by their teachings. Words do not do their teachings justice, so you will have to check them out to understand. 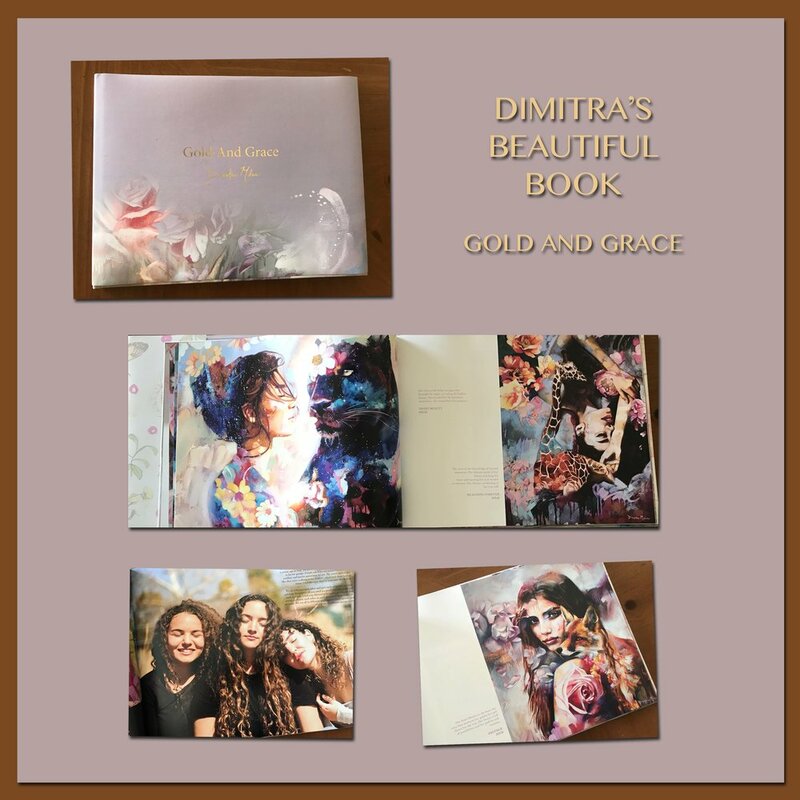 DIMITRA MILAN’S MOST BEAUTFIUL ART BOOK. SEE HER WEBSITE LINK TO PURCHASE IT. In the quiet moments throughout the day and night I am being reminded… “BE STILL.” Diving into the Stillness and letting go is definitely becoming more and more a part of my day. This painting has been teaching me to be still and allow my Soul to guide me to my Real Self, the beauty that lives inside. I enjoy creating art videos as much as creating the painting. I get to observe the process through the eyes of the observer. Surrender, "A Journey Of The Soul"
Stillness has been speaking to me lately. Whispering and nudging me towards more internal guidance of my soul and Higher Self, the part of me that connects to the Divine All or as many call God. The whispers are gentle and loving. I ask for gentle steps. I want to be lead more internally. I want to connect to my Divine Mother and Divine Father. So I surrender. I surrender, how I think things should go or how I want them to go so I can be guided to the Higher Vision. Since I can’t see the bigger picture, I surrender to the Divine flow. Much is hidden from view. Of course it is a good thing that I can’t see too far. I might not want to walk through some things I need to learn. There is a reason for everything that is happening in each moment. On the surface, I may not understand nor trust these steps but down deep within the stillness I know it is all meant to be. I also know it will be less harsh if I listen to the Stillness. Sometimes I resist being still. My fear rises up. What will I find within myself that I didn’t realize? Am I ready? I step lightly. Fear lies to us. It may trip us up if we don’t move through the energy. It can pull us out of the NOW and thrust us into future tripping. Regret can trip us up too, causing us to rush back to the past memories. But fear doesn’t like stillness. For stillness doesn’t lie. Fear is a lie. It can only exist when we are living out of the NOW. Funny how the mind cannot grasp this. Deep down in my stillness, I know the past and future all exist in the NOW. For this very moment was created from my past decisions and this right now moment is creating my future possibilities. So NOW contains it all. NOW is magical and mystical. We cannot control it or grasp it. We can only experience it. Separation is the illusion. Since the mind can’t grasp this, it tries to fall asleep, into old familiar repeatable patterns. If I don’t walk through my fear it gains more strength and I tumble into the state of nothingness. Like a zombie that is walking dead. But I can’t stay asleep forever. Other parts of me remember. So I return to my breathing, I allow my breathing to whisper to me. It whispers that I am still here. Each breath in and out allows me to return to the NOW. My breathing slows, everything slows. My mind and body slow down, back into the present. In the present, I feel a doorway opening. I am ready. I am ready for another way of seeing, experiencing and feeling life. I pay attention as I breathe in this moment. I let go, surrendering it all. Nothing feels freer. Thoughts flow on by but they do not disturb me. I just let them flow. I want to live in this moment. But holding on is not living. Just like breathing life is about about letting go. In and out….in and out. We don’t control our breath. We let it flow. I am learning to watch my breathing as it relaxes me… in and out, in and out. Learning to let go. Stillness is my greatest teacher. It reminds me that everything I truly need is inside. In this moment I am truly grateful. Gratitude flows out. It flows through my heart and out my tears. I remember, I am one with the dreamer and the dream. I am part of it all. I am not the ALL but I exists in it. I am ready to walk through this new doorway so that I can experience surrendering even more. I step lightly. Small baby steps. I know I will fall back asleep again and again. But I also know I will remember to wake up again and again. So here I go, one gentle step. All I am asking for and all I want to give is gentleness. Gentle and loving steps. Check out the girl climbing the steps. I want to move into creating animation but it will take a long learning curve. Until then I am learning to tweak a few things using photoshop, iMovie and Keynote. who are speaking to us all the time. Lana "Goddess of Still Waters"
When chaos enters our lives, I believe, it is a call to be still so that we can listen to our higher guidance within. In the stillness, I am reminded that the further I get away from my inner self, the more bumpy and chaotic my external world becomes. Whether we call this internal guidance the Divine Within, Our Intuition, Our Higher Self, God, Allah, Krishna, Buddha, Shiva, Gitche Manitou, the Universe or any other name, to me it is all the same. I see this communion as ‘Oneness’. to the” All in the One and the One in the All.” For me there is no separation, except when I forget who I truly am. Then I know it is time to return to the Stillness. 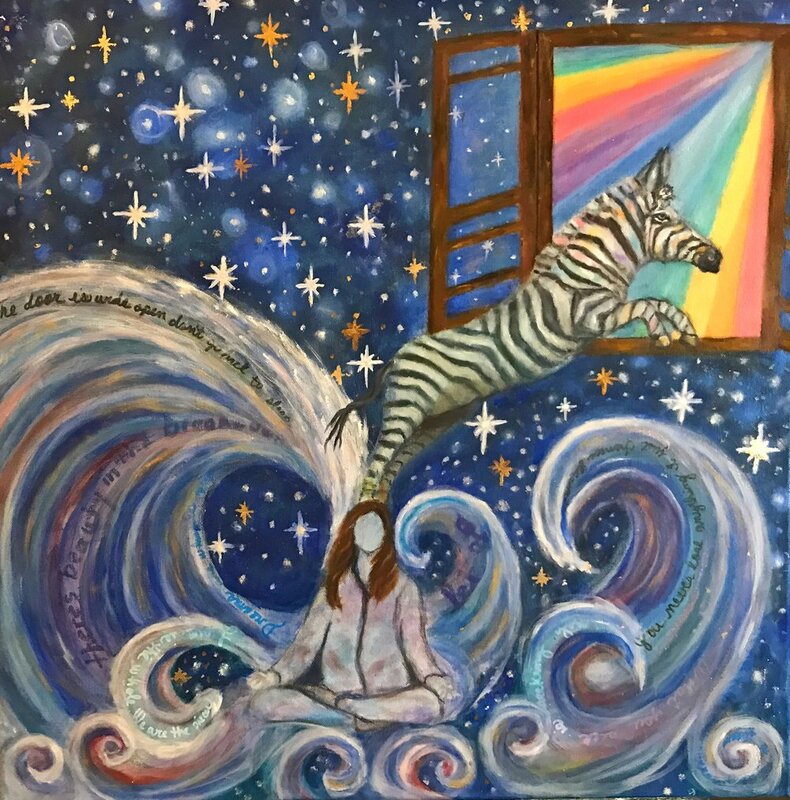 This painting was created as a message from my Higher Self, who I felt was nudging me to add more stillness into my life, so that my connection to my Higher Self and my intuition could expand. The symbols in the painting represent the Divine Feminine and the spiritual world within. The first time I learned about totems was when I began to notice crows entering my consciousness and in my external life in a profound way. Everywhere I went, I saw tons and tons of crows. I began to feel a deep soul connection to them. Our house in Birmingham, Alabama was sitting in the middle of a very large family of crows and they spoke to me often as I dove deeply into my spirit. Among this family of crows was also one lone Hawk that often flew in and out of our vortex. Each time he flew in there always seemed to be a quiet stillness that came over me. In that stillness, I would hear some kind of message that would help me to see the synchronicities that were flowing into my life. These synchronicities helped me to feel the Divine Presence guiding me along my path. To receive these messages, I had to dive more deeply within the stillness and listen more intently to the whispers. In quiet moments with my soul, I was reminded over and over to be more gentle with myself and others, as I traveled along my journey of self-discovery. The crow is associated with the great mysteries of life. If you keep seeing crows around, you need to pay extra attention to the messages they bring. The power sign of this bird brings mysticism. Your tenacity and persistence will pay off. Crows do not give up easily. They will pursue their target and get whatever they need, when they need it. You are gradually shifting into your confident self. This painting and time-lapse video was created to honor the healing of our oceans. It is time to wake up. Our oceans are our lungs we need them to breathe. It is my honor to share my thoughts about this sweet painting that came through me. Once the idea came to me I was overjoyed with bringing the vision onto the canvas. My anticipation and enthusiasm level was so very high. Yet every time I thought of her there was no movement from my mind into my heart. I knew I needed to wait until the energy in my heart moved me. Even after finishing the background I still had to wait months for the energy to rise up within. I was aware that this journey would include my own internal emotional healing as well as my healing prayers for the ocean. CHECK OUT HER WEBSITE TO SEE MORE. I was inspired by one of the most beautiful artist I have had the pleasures of following on Instagram, Lindsay Rapp. I believe Lindsay’s art carries the most beautiful, delicate and feminine energy, yet it also is equally very strong, powerful and vivacious. Her love of the ocean is embedded in many of her paintings and they inspires me daily! Don’t take my word for it check it out. You will definitely want to follow her and I know you will want a beautiful yourself. I hope to meet Lindsay one day when I visit my daughter in California. To see and learn more about Lindsay’s journey check out this lovely video. I’m standing in the ashes of who I used to be. My youngest daughter, Mary Kathryn got her first grown up apartment and we were so very excited for her. It was a lovely apartment with a wonderful roommate. This was a fresh new start to her next chapter. She had settled into a job with Disney after completing her internship. She couldn’t have been more excited! I had fun roaming around Goodwill stores finding a desk, chair, table to paint. We also got her a beautiful bed. She was set. Then I remembered that she wanted a painting I had started years ago. I had started it for her sister but when she and I decided to go a different direction I had decided to keep this one. So I started a new one for her. That is when Mary Kathryn said she wanted it for her first apartment. She was 15 at the time. Little did I know how fast these days would fly by. Now I needed to give this painting the energy, passion and upgrade it deserved and my daughter deserved. Mary Kathryn was rising out of the ashes of her childhood. Out of the homeschool years and out of the years of feeling different and alone. Now she is ready to start her own life. She is on fire! I dedicate this painting and video to my daughter. May you keep dreaming and allow these dreams to rise up and find their wings. This is a story that is very dear to my heart. I was living in Little Rock Arkansas and had been living there for over two years. I knew I moved there with my husband so that we could healing that came in the form of a job move for my husband. I knew I was going to heal some deep inner child wounds. To go into my cocoon. Moving from my family and especially my daughters gave me time to dive deeply into my deepest parts within. But when the time in my cocoon had reached its point of transformation, I was ready to bust out of my cocoon. The only problem was my husband was not completely finished with his lessons. ( I didn’t know this at the time.) I felt as though my spirit was being held back. So I do what I know to do. I went even more deeply within and put my foot down. I asked why I was still stuck in Little Rock if I had completed what I came to do. I got back that my husband needed a bit more time. Not the 5 years he was thinking. Then I heard, “paint your dreams and keep painting. Before you know it, it will be time. So I painted this watercolor and the day I finished creating the video my husband came home and said, “ok what I came to do I have completed. We can go. (See a year ago I got the message that we could go to Sarasota for our anniversary trip to see if we wanted to move there.) Immediately we put our house on the market and flew down to Sarasota looking for houses. I house sold immediately to the first person who looked at it. I had less than 2 weeks to pack my house because my husband decided we would move down when my daughter left for Orlando to start he internship with Disney. Needless to say, it was a whirlwind. We packed everything all up and had it stored in Little Rock as we left for Sarasota to our rental house. We were on our next adventure. And what an adventure it was for us all. We finally found our dream home. It was the only house we agreed on and it was magnificent. Here is the video that says it all. My version of "Little Red Riding Hood"
Wearing a special red cloak of inner strength and power, Little Red Riding Hood sets out on a journey to claim her independence. She knows that in order to achieve real self-empowerment she must conquer some of her greatest fears in the forest of her past. The time has come for her to let go of her dependency on external relationships so that she can reclaim her own confidence and courage. As soon as Little Red steps into the dark woods, the snow begins to fall, casting an eerie veil over everything. Submerged in the dark silence of the frozen forest she immediately feels the separation from All That Is. Everything collapses inward until it feels like a dark hole compressing onto her. Although the lonely darkness feels like an abyss of bone chilling madness, there is a part of Little Red that still remembers she is never truly alone, for perched on her shoulder is the white dove of Divine Guidance. Cautiously moving further into the forest, Little Red shudders from the cold and from the deafening silence surrounding her. Unable to take another step forward, she slips to the ground and sleep creeps in as her awareness begins to fade away. In the veil of sleep, her fears rise up and cast a dreary dark dreamscape. Although she cannot see anything, she feels a shadowy figure lurking behind her. The shadow follows her everywhere she goes. She feels like a prisoner in her own heartbeat. Frozen with fear, she cannot speak or even run away, for she realizes that there is no place to hide. Finally, she wakes up from the torment and calls out into the darkness, “what do you want from me?” All she hears is the pounding of her own heartbeat. Too weak to stand, she falls back into the snow as an explosion of tears erupt from the deep recesses of her body and mind. As she wails and wails from the depths of her soul she releases years of pinned up grief and and sadness. And the above painting is how she looked after my journey. Realizing this voice is her own frightened and lost inner child, Little Red collapses further into deep anguish and despair. She wonders how this child within, who abandoned so long ago, will ever forgive her. With tears streaming down her face, she gently rocks her inner child back and forth vowing to honor and protect her as best she can in the future. Finally LIttle Red realizes that the love she has been seeking externally, has been right inside herself all along. in front of a camera. Pictures are a thousand words but seeing in person goes beyond a thousand pictures. to redo our 1950's bathroom and add a sunroom along with a diamond wedding ring (When we got married we were so young and broke so we used my grandmother's ring instead. I will add here that I got a beautiful one for my 25th anniversary). So being the practical person I am I chose to let Hawaii go, at least for a while. However I must say, it was not an easy decision and with it came some big heartache, (some wailing and some big fights). "I mean after all, it's Hawaii. Isn't that everyone's dream?" So this is why it was a REALLY, REALLY BIG DEAL FOR ME to come to the land of Paradise. But I will say, Hawaii never stopped whispering to me. Finally her voice became my voice and then my daughter's as well, it wasn't long before Hawaii spoke even to my husband. Can you hear her calling? "Can you hear her calling?" Having less than a week to spend in Hawaii, we decided to focus our trip on Maui. We were NOT disappointed! Maui truly lives up to everything I ever heard about it. It is as close to paradise that a place on this Earth can be. I mean it is gorgeous! Of course, I know that we bring ourselves wherever we go, so no place can take away our troubles but it can help us get in touch with ourselves on a deeper level so things in our life can be put in their proper perspectives. Maui gave me a gentle reminder to slow down and observe, for everything is created from the inside out. Here are some fun pictures of our adventures. Horseback riding, snorkeling, sightseeing and good food. We are leaving Maui with many wonderful memories! and Earth is our home. Here is a short video showing my process and the inspiration. Beautiful spiritual moments in Maui. So many adventures so many good times. of the inspiring land of gentle transformation. " I designed the painting around the four elements, (earth, wind, fire and water) which connects everything and everyone. My hope is to connect the heart and mind with a feeling of Oneness. I chose the name Iolana for the Hawaiian girl because it means "soaring bird" which has always been the image we associate with freedom or transformation. Since birds have the ability to fly above they can see life from a higher perspective. I also chose to add the title "Love Gives Life Within" because it is a Hawaiian saying that I think best sums up my experience on Maui. It opens the heart and nudges us to go within. Although our body has 5 senses our soul connects us through our intuition, peace, trust and empathy. We have to learn to trust what our soul sees and feels. It is our inner knowing. We have 7 chakras or 7 spiritual doorways. Each has a meaning and a connection to everything. We learn through these doorways. This painting is my attempt to share my soul connection to Hawaii. I don't always want to share my inspiration or interpretation of a painting because I want the viewer to find their own message but this one wanted to be heard so I will try to share my story. As you can see, Iolana, is shown not only blending in with the environment she is one with it. I tried to create a harmonious connection to everything around her. Even with a brewing storm and fire blazing in her hands, she isn't knocked off of her center. She is at peace with all that is. I will begin at her crown and go down to the root but then I will connect back to the seagull, who represents freedom. There are 7 Plumerias representing the 7th chakra called the crown chakra. The Plumerias are gently flowing into the waves of emotional transformation (reminding us to allow the emotions to flow effortlessly even in the midst of the storms of life).The green lei around her neck is flowing and connecting her throat down through the heart chakra and on to the root. It represents the healing power of the throat and heart chakras which connects us to our root and then with the world. When we are able to lovingly speak our truth and open the heart we can hear the world around us as well. Next you can see that Iolana is holding the flames of a blazing fire which connects the control chakra (our will) and sacral chakra (our sexual and creativity chakra). This is where our passions and desires create our world.. It is also the place that allows us to burn up and heal our karma (the healing of ancestral, childhood, and sexual wounds). Three red flowers are seen below the fire, representing the trinity of life and the transformation of the father, the mother and the child. From here we can pull our attention to Iolana's grass skirt. You can easily see that her skirt is blending in with the sand. This symbolizes her her grounded presence with the Earth and her root chakra which is also known as the foundation chakra. When we are grounded within ourselves we are grounded with our world. And lastly but definitely not least, the seagull is soaring right above her head and the crashing waves which is a symbol of freedom even in midst of chaos. Freedom is not only a state of mind, it is our soul's birthright. We are the ones who imprison ourselves so it is up to us to set ourselves free. However remembering this is a journey and it takes as long as it takes. But when are ready to remember with all our chakras , it can be only one breath away. A couple of my never ending lessons of life! it is not the destination." unless you want it to be." "It takes as long as it takes." "The light cannot exist without the dark. but rather two poles of the balance of unity." I had so much fun with "Seeing From The Inside Out"
When you are ready to feel, it you can heal it. The background of this painting was inspired by an online class I was taken by Olga Furman called "Paint Your Heart and Soul 2017". The teacher was Basia Zielinska. But the inspiration from the class stopped with the background. My spirit and higher self wanted to take me on a totally different journey. I had been going through some deep inner healing work surrounding my relationship with my father, All my life I sought my father's approval as all daughters do. But my father was a 6'6" stoic man. He devoted his life to be a college professor and never really spent any time with my two brothers are me. I lost myself in trying to make my father happy. Finally one day he told me that I not only hadn't done anything to please him, I never would. A lightbulb finally went off in my head. "WHAT? ALL THIS TIME I WAS TRYING TO PLEASE YOU WAS COMPLETELY WASTED? Although it has taken me several years to grieve this loss, I am finally pulling myself out of the hole I had fallen in since I was a small child. Everyday I have to pull back inward to make sure my inner child is loved. But finally I learned that I am the mother and father now. Now I can give her the love from the inside out. The tears flowed as I made this piece. I released so much old stuck energy. ~This piece of art is a symbol of transformation. It incorporates and blends the energies of fire which burns up the old out grown parts of our selves, along with the healing and cleansing power of water which releases the muck through the tears of grief, and the freedom that the winds of change bring as they yeah us how to fly while still being grounded in the presence of the Earth. ~"If nothing ever changed, there would be no butterflies." Above are my speed painting video of the process. The one on the rightis a shorter one minute version. I do recommend watching the longer though because it is of one of my favorite songs by the Counting Crows. This painting was inspired by the series called "The Tudors". I was mesmerized by Natalie Dormer's performance as Anne Boleyn. She has these very intriguing eyes that pull you in. I also was inspired by a class I was taking online called "Paint Your Heart and Soul". The teacher was Lucy Chen and she was inspiring us to break out of our comfort zone by painting a hand. I was so out of my comfort zone. I had to take a picture and paint my own hand which is very large. I have extra long fingers. Although I was not thrilled with the results I knew it was as far as I could go at this time. I definitely need to practice hands more often! The motivation for this painting came from a promise to myself to let go of things that are not working in my life so I can see another way to do things. The symbol is in her reading a letter and pondering on letting it all go. Enough is enough. Here is a short video showing a couple of stages. This painting was created and inspired by my love for Adele's music. I was turned onto her music several years ago by my oldest daughter Natalie. She and I ,along with my other daughter, Mary Kathryn, were very fortunate to be able to go to her 2016 Hello Concert in Nashville Tennessee. When I returned from the trip I was so inspired to create this painting for myself. I have added a short video I created of the process and snaps from the concert. 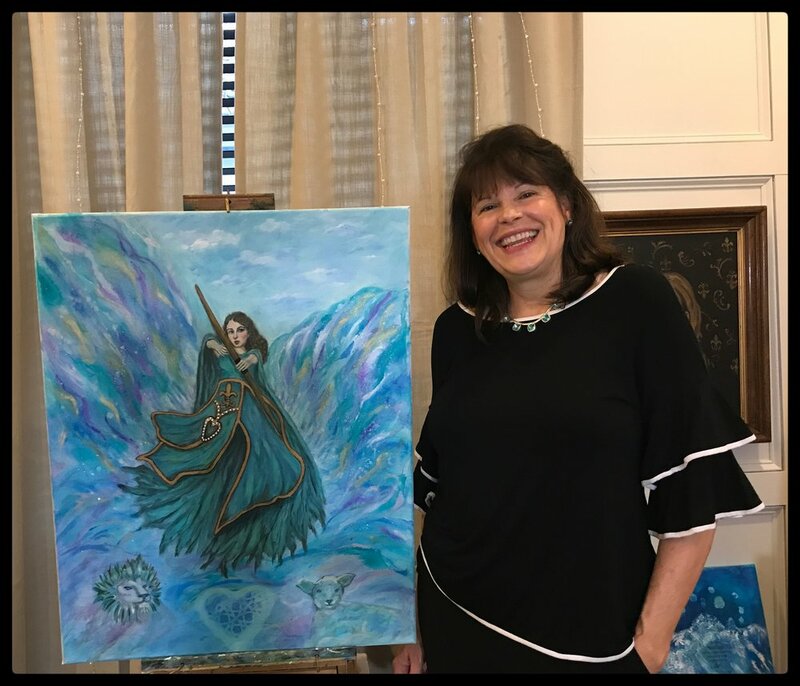 I am taking an Online Class called "Paint Your Heart & Soul"
This wonderful online art class by Olga Furman called "Paint Your Heart and Soul" is inspiring me to find my artistic voice again. After going through many changes within myself as well as on the outside over the last 2 years, I am finally finding some balance again. My husband and I moved two years ago out of our home state where we spent our entire lives to a beautiful new dream home and new life. Although the transition has offered us space and time to grow spiritually, individually and in our relationship it has also brought a sense of loss. As one chapter of our lives was closing a brand new adventure was beginning. During this time within my cocoon, I temporary lost my artistic voice but now that I am beginning to break free with my new wings. This online class is helping me to see the world with fresh eyes. If you are interest in Olga's class click here. Here are a few pieces I created from the lessons. This is the first time I have ever used charcoals and tinted paper. I found the charcoal most forgiving and I look forward to doing more portraits in the near future. It is not easy to face my fears within to make art. If I am blocked in anyway I cannot coax myself into facing my fears and letting go so I can create. Art always takes me on a journey within, a healing journey. It can be quite scary to visit these places I didn't even know existed. I see the sadness in her eyes. This exercise was about connecting with animal totems that speak to us. Since I have been working with the trinity of the inner child, mother and father within I wanted to use the Lion to represent the spirit or higher consciousness. Through the innocence of the child, the emotional strength of the mother along with the courage of the father we embrace our full self. This exercise was quite fun. Although in this print you cannot see all the layers of color that were created, in person they show through much more clearly. What was fun about this project was how I intuitively knew there was an angel of fairy that wanted to show up before I actually saw her. Then the next day I looked and saw her in the background. I sketch an outline of her and then when I started painting her in I noticed water was coming from her hands. So this painting was already there. I just brought out what wanted to come out. This happens quite often when I paint. At the very least, some part of my art journey always incorporates this process. It is such an intimate conversation with my spirit and higher self. Much like a lesson I need to learn. As I enter my third act in life, a period I think of as 'Embracing Your Wisdom' stage, I find myself experiencing what some might call a life review, as if I were dying. I'm not dying (at least as far as I know) but I am allowing myself to go through the same process many experience as near death, the deep reviewing of life and making peace with my decisions and choices. I want to be peaceful with myself and my past so that I can enter a more freeing state of mind and body. I don't think we have to wait for death or have a near death experience to learn some really deep and important lessons from our life. Even though I believe death is a natural process of life as is birth, I used to turn my head away from death's lessons. What a shame too because I think death and birth are our greatest teachers for how to truly live. I have always felt more alive when embracing a newborn baby but I must admit I felt like I was going to die when saying goodbye to a love one. Yet goodbyes always remind me to treasure my limited time on Earth. Saying goodbye has never been as easy as saying hello. So I thought, doesn't it make sense to want to learn how to let go more gracefully? Even though I have always had a underlining desire to study death and dying I also had a fierce resistance to it as well. This all change when my dear mother-in-law, (who was like a mother to me) made her transition. I felt like it was the most beautiful gift she could have given to me. She moved through the entire process with the most beautiful grace and love. She never complained or displayed a sense of fear. I learned so much about the natural process of dying. Of course I know a lot of this had to do with the fact that she was ready to let go. She had lived a full life without regrets. I learned so much about life by facing my fear of death. One of my favorite memories was also one of the last times she was conscious with us. My daughter had asked to buy a Christmas music card for her. I will never forget her display of pure joy and wonderment like an innocent child opening her first gift. As she smiled and looked around the room at everyone barking orders of how she should do this or that or what they could do for her not realizing her time with us was now very limited, she said, "this is a very busy world." I knew she had already been in and out of this world. I will never forget how she cherished that simple musical card, opening it again and again to hear its magic. She embraced it as if it contained the entire world. No one noticed her pure joy except my daughters and me. Yes, it was a fleeting moment but it will also last my entire lifetime. It was such a wonderful reminder of how to cherish the simple joys of life, for they are truly the most treasured gifts of all. I know death feels like it steals away our hope while birth feels like it gives us hope, but I am beginning to see that both can give us hope and teach us how to live...truly live our lives. That is if we are brave enough to experience these gifts more intimately. Through my own internal life review process I am learning to forgive myself for things I did to myself and to others. This is not an easy journey. Whether we are called to learn about ourselves inwardly or outwardly much of the same things can be learned. For me the call just got louder and stronger until I finally let go of the resistance. Was I being guided or even pushed inward? Maybe, I don't think I would consciously choose to walk this scary path but I am learning more than I thought I could about myself. In my youth, I am sure the thought never crossed my mind to look backwards, I was too busy climbing smaller mountains. There was more in front from which to learn than there was from behind. But now I find self-reflection to be a more gentle and graceful way to see not only where I have been but also to plan where I choose to go. Does it take courage to muster the strength to dive into the shadows of my past so that I can mine the pearls of wisdom within? But it takes even more courage to allow myself to share my process for all to see and judge if they so choose. nor is death the end. On a side note. Yesterday I was talking to a Hospice worker named Emily about my aunt's death directive and how I wanted her to be comfortable and without pain but also to allow her to have a natural parting, on her on terms. This was how my aunt lived and how she wanted to leave this world. I told Emily that my aunt has always been very strong and I wanted her 'will' to be the guideline. I said I know the world is still so afraid of death and that is why they try to control it so much. which actually does not allow the individual to go in peace and on their own terms. There is a selfishness about the way we try to control death which is often misguided as compassion. Emily and I talked so more and she said, "you should be a Hospice worker. Few understand the death process and your gifts are so needed." I had thought of volunteering before. However I still take too much emotional energy of others so it would not be healthy for me at this time. Wouldn't it be wonderful if one day we understood death more and feared it less? If we were not so selfish about our loves ones being called home just as the other side misses the love ones being born here. If we realized that everyone on a higher level knows they are going home and on deeper level are ready for the transition. Most often our love ones try to tell us on some level about a week, a month or the last time they saw us before their departure that they love us. It is almost like their goodbye. It might be something they said or they might come in a dream. Some may even connect with us after their departure, like in a dream or some form to say, "I am okay". I think we are having more and more near death experiences due to the technology that allows us to bring people back after their heart stops. I am sure we are also ready to face death more. Not only are we very thankful that we can saves lives but maybe this ability to bring people back from death is also teaching us some very valuable lessons. Every near death experience I have had the honor of reading or listening to had many things in common, but one of the most important is the individuals come back unafraid of death as well as a deep appreciation for life and for others. They often change their jobs to serve others. I think that should ease our pain and fear about death a little. “We don’t stop playing because we grow old we grow old because we stop playing.” ~ George Bernard Shaw. Today with my inner child, as well as my adult self, I am ready to take a new step into the next chapter of my life. I am 57 years old and I have a brand new page to fill. Although I do not know what will come next, I am finally ready to still the waters within so that the void can be filled. Twenty-nine years ago, I woke up and realized that the path I was on was not taking me where I wanted to go. I had a toddler to protect and raise. I was now a mother. For the next several years as a young adult, I tried to follow my mom and dad's way of living while adding only a few new things I was learning along the way. The pressure to please others let me stifled and trapped within the walls I had built to protect myself. These walls were now becoming my prison not my protection. Finally nine years later I realized I needed to take another independent step towards my own truth and path. This is when I met a soul friend who was the perfect reflection for me to see the lost parts I needed to reclaim and the outgrown things in my life I needed to let go. Together we peeled back layers upon layers of our own old wounds and old outgrown patterns. As we dove down into the shadows of our past we got closer and closer to our true and pure essence within. But the torrent winds of change drudge up old fears of abandonment. These fears dug their claws in. The rebellion got louder and louder the closer we got within. Finally we found our very wounded inner child who was scared and alone. What to do now? That was the haunting question. Two years ago, I moved away from all that I knew. I left behind: my hometown, my adult home of twenty-six years, my parents who pushed me away, my role of motherhood and being the matriarch who cleaned out all the emotional garbage for our family and restored the peace, my artistic voice, and the building of a small art partnership with my oldest daughter as well as the role of a teacher for my youngest daughter. My house was a bustle of energy. Everyone was at home 24/7, including my husband, until one day I woke up and looked around, nothing was the same. There was a deafening silence and heaviness but mostly there was an emptiness and void. So I did the only thing I could do, I let the unthawing begin and I allowed the tears to flow. Everyday the rainstorm came flooding down. But every day I picked myself up after the storm had settled and walked toward the sunshine. The rainbows didn't come but I became more peaceful with the storms. I listened to the stillness in between storms. I stared into the bone chilling reflections of the mirror and found lost parts within myself. Finally a small frightened and lost child within began to quietly speak to me. She was cold and lonely. I had left this fragmented part of my inner child alone long ago so that I could take care of the needs of my mother, a role reversal so to speak. I left a part of my inner child in the cold in order to survive in a fractured home. Frozen and trapped in a cage within my heart this inner child held my hopes and dreams. She also held my self-love and self-belief. Patiently waiting within for the day I would become strong enough to find her and free her from the cold isolation of abandonment. Finally she could cry out to be heard and finally I could hear her. Today I can hear her loud and clearly. As I rebuild my trust with her I know she will guide me to the next step for she holds the keys to unlock doors I have yet to step in. Can you hear your inner child? Realizing this voice is her own frightened and lost inner child, Little Red collapses further into deep anguish and despair. She wonders how this child within, who was abandoned so long ago, will ever forgive her. With tears streaming down her face, she gently rocks her inner child back and forth vowing to honor and protect her as best she can in the future. Finally LIttle Red realizes that the love she has been seeking externally, has been right inside herself all along. 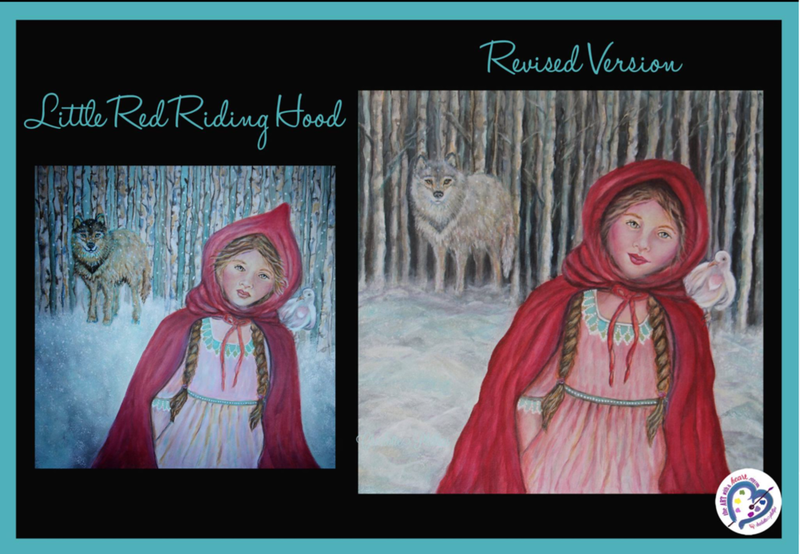 Thoroughly exhausted yet more confident and empowered, Little Red Riding Hood emerges out of the forest of darkness. As soon as she stands in the clearing with the sun shining through, the snow begins to stop. Feeling a presence behind her Little Red takes a deep breath in and out. No longer fearful of the shadow, she realizes it was just a messenger delivering what she long wanted to remember. She is aware that there will be times where she will fall back asleep, however, since she found her way through the forest of darkness once, she is confident that she will be able to wake up and walk through it again. Together with the child that lives in her heart, she moves forward on her journey of life, creating new adventures and dreams one step at a time. This is a story I hope to finish. I will be sharing parts of my story, "Charlie, the Caterpillar (Journey to the Heart) as I get to the first wave of editing. I am writing and illustrating this story as I go. Since I am very long winded and I often repeat myself the editing will be slower than I would like. This blog is like a journal to me and since I am sure no one will actually read this I feel free to share it. It is freeing to at least put it out into the world in a safe way until I get more deeply into the editing process. Although part of me does want to publish this story one day, the other part says, "no this is just for me." Either way it is a wonderful way to go more deeply within my journey of self-discovery and journey to my heart. I am writing this story as I am learning it.